Partly cloudy this evening, then becoming cloudy after midnight. A stray shower or thunderstorm is possible. Low near 35F. Winds NNE at 5 to 10 mph.. Partly cloudy this evening, then becoming cloudy after midnight. A stray shower or thunderstorm is possible. Low near 35F. Winds NNE at 5 to 10 mph. "Cupcakes -- the good mood food." That's the motto for Lynn Rovelstad's new business, Katie Cupcake. 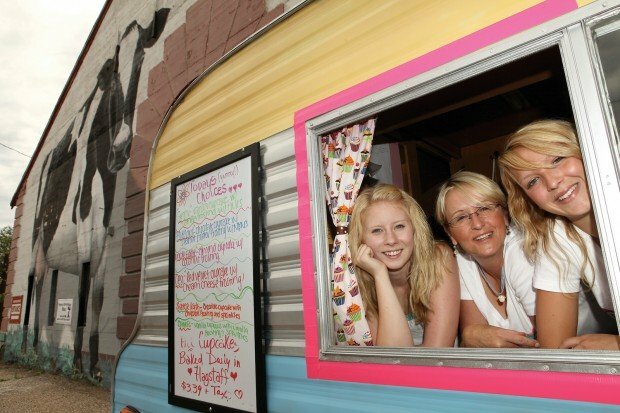 Nestled in an aluminum travel trailer in front of the Furniture Barn, Katie Cupcake sells -- you guessed it -- cupcakes, along with coffee and assorted other beverages. More than that, it sells an experience. Rovelstadt wants customers to feel free to kick back in one of the brightly colored Adirondack chairs out front and relax while they enjoy their cupcake and coffee, listen to fun, upbeat tunes and "have a happy moment." "Let us try and help you brighten your day," she said. She added that her goal is to "leave the person feeling a little better than when they came." There aren't a lot of places in Flagstaff that do that, she said. And there certainly aren't any other places focusing exclusively on cupcakes. Rovelstad got the idea about two years ago while visiting her sister in Austin, Texas. They went to a similar place and she walked out saying, "I'm going to do this." "I just thought it'd be a really good fit for Flagstaff," said Rovelstad, who moved here in 2004. The local artist and Ski Patrol volunteer has been working on making Katie Cupcake a reality ever since -- and the idea seems to be taking off. Rovelstad opened on May 17 and, after a two-week closure to address issues with the baker, reopened on June 15. She has been doing brisk business ever since. She's open seven days a week, and has sold out nearly every day. On May 26, all 80 cupcakes were gone in about three hours, and in the course of an hourlong interview on May 27, at least a dozen people stopped in for cupcakes. One other stopped by just to check things out. Katie Cupcake is named for Rovelstad's daughter, Katie, who graduated from Sinagua High School on May 28 and will head to Stanford in the fall. "'Katie Cupcake' is cute. 'Lynn Cupcake' isn't cute," she said to explain the name choice. She joked, "I get all the work and she gets all the glory." It has been a lot of work. Rovelstad had to scout for the perfect location, securing a highly visible one right in front of the cow on the Furniture Barn building. After an exhaustive online search, she also located a travel trailer right in Flagstaff's backyard. She and her husband, Todd, were driving around in the Slayton Ranch neighborhood and saw one on someone's property. They approached the owner and it turned out he and his wife had just been talking about selling it that morning. A 1964 model, it needed extensive renovations. Rovelstad cleaned and painted it to fit with her theme, put in new flooring and windows and -- in keeping with the idea of making it fun -- dressed it in a pink hula skirt and dubbed it "the cupcakemobile." She even found cupcake-themed fabric for the curtains at the windows. Cosmetic improvements aside, she also spent a lot of time perfecting her recipes. "My family was eating cupcakes forever." The cupcakes are 100 percent organic and come in four basic flavors: Vanilla, double chocolate, almond and, the top seller, red velvet. Icing and toppings make for 20 different varieties, with about four available each day. "All of them are named after friends and family," she said. There's even one named for the family dog, Shadow. It's a chocolate cupcake with chocolate frosting and M&Ms. Rovelstad's favorite is the Uncle Eddie, an almond cupcake with coconut frosting and coconut shavings. Employee George Heckard's favorite is the Asher, a chocolate cupcake with peanut butter frosting and candy pieces. At $3.75 each, they're a little pricey. (All-organic ingredients are to blame.) But they're worth it: delicious and with just the right amount of buttercream frosting. Of course, the icing means they're not exactly diet-friendly. But they do have the bonus of being portion-controlled. "I wasn't about making a huge cupcake, I was about making a really special cupcake," Rovelstad said. She also wants to make it an affordable treat: It costs just $5 for good-sized cup of organic, fair trade coffee and a cupcake. Compare that to many restaurant desserts, $5 by themselves. All the cupcakes are baked fresh daily by Mountain Delights -- but don't go looking for them there. "You can only get them here." 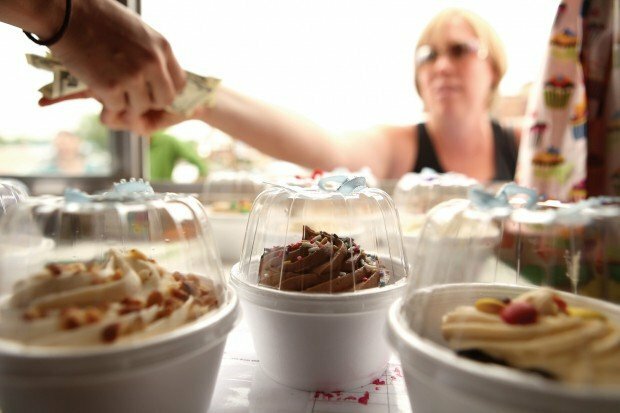 Rovelstad varies the number of cupcakes she orders each day, using the weather forecast as a guide. If the day is predicted to be extraordinarily windy, she'll cut back a little. "Who wants to eat a cupcake in a hurricane?" she asked. Katie Cupcake opens at noon and stays open until dusk or until the cupcakes run out -- "whichever comes first." Being an outdoor business, Rovelstad plans to stay open into October, weather permitting. She also plans to have a grand opening celebration in the near future. The details have yet to be worked out, but she knows one thing for certain: "It's going to be fun."